Not accounting for inflation, Maleficent is now Angelina Jolie's highest-grossing film to date, with the Disney film now crossing the $500 million mark at the box office. The Disney live-action film Maleficent just crossed the $500 million mark over the weekend, and is now considered actress Angelina Jolie's highest-grossing film to date, but that's not accounting for inflation. In North America, Maleficent has shown impressive staying power as it stayed in the top five in its fourth week, where it grossed $13 million for a domestic total of $186 million. Over on international markets, the Jolie-starrer raked in $44.7 million from 54 markets, including an impressive $20.3 million debut in China. To date, Maleficent has earned $335.6 million internationally and $521.6 million in total worldwide. Jolie's previous high was the action-comedy film, Mr. & Mrs. Smith, which has her current partner Brad Pitt in the co-starring role, and managed to total $478.2 million in 2005. Also of note, Maleficent has now passed Disney's other live-action hit, Oz the Great and Powerful, which has grossed over $493.3 million worldwide. While the numbers are impressive enough as it is, the film isn't done yet, as Maleficent has yet to debut in Japan. For reference, its best international markets being Mexico ($40.4 million), Russia ($34.8 million), the UK ($25.7 million), and Brazil $24.2 million. You can watch what The Escapist thought of Maleficent in our review of the film here, and make sure to also check out how early concept designs showed a young Maleficent covered in feathers instead of hair. 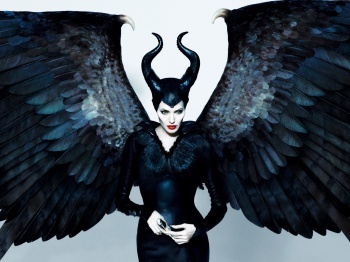 Have you seen Maleficent yet and what do you make of it? Should Disney adapt other animation villains seeing how successful this one is?